Jennifer Farmer ’99: Communicating Against the Grain In an era of political and cultural polarization, how do you communicate a message on behalf of a group that’s often generalized and stereotyped in the mainstream media? It’s a question that weighs on the minds of people on both ends of the social divide, from religious conservatives to social and cultural radicals, and many people in between. 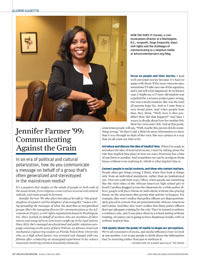 Jennifer Farmer ’99, who often introduces herself as “the granddaughter of a pastor and the daughter of an evangelist,” makes a living spreading the messages of what she describes as marginalized groups. 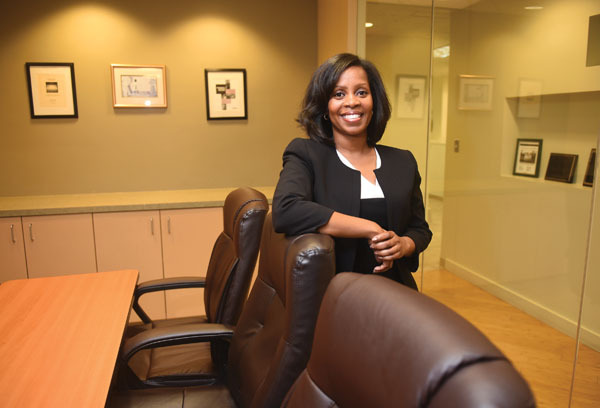 She’s the managing director for communications at the Advancement Project, a civil rights organization based in Washington, D.C. She’s worked on behalf of workers who are members of labor unions and young African Americans caught up in the legal system. Since 2013, she’s managed an educational and public relations campaign centering on the story of Kiera Wilmot, an African-American mechanical engineering student at Florida Polytechnic University who, as a high school junior, was arrested and charged with two felonies after conducting an unassigned experiment in her science classroom involving common household chemicals. Focus on people and their stories. I lead with personal stories because it’s hard to argue with those. If the issue concerns race, sometimes I’ll take race out of the equation, and I just tell what happened. So in Kiera’s case, I might say, a 17-year-old student was expelled for a science project gone wrong. She was a model student. She was the kind all parents hope for. And so I start from a very broad place. And when people hear that, they think, “Well, how is that possible? How did that happen?” And then I weave in details about how her mother felt. How her twin sister felt. And at that point, sometimes people will say, “Well, maybe this person did do something wrong.” So then I add a little bit more information to show that it was through no fault of her own. She was curious in a way that we all want our kids to be. Introduce and discuss the idea of implicit bias. When I’m ready to introduce the idea of structural racism, I start by talking about the role that implicit bias plays in how we react. Everyone has a bias of one form or another. And sometimes we can be acting on those biases without even realizing it, which is what implicit bias is. Connect people to social contexts, and show why context matters. People often get things wrong, I think, when they look at things only from an individual standpoint, rather than an institutional one. This can work both ways. Often, when people see something like the viral video of the African-American high school girl in South Carolina dragged across the classroom by a white police officer, people will place blame on individuals without also placing blame on the structures that permit that activity to happen. For example, they won’t realize that police officers are disproportionately placed in schools that are predominantly African-American and Latino. And they also won’t realize that these police officers don’t get adequate training for the role. They’re trained to enforce a criminal code, and if you place them in a school setting without training, of course you’re going to have disastrous results, with or without implicit bias. Talk openly about the power of media to shape our perceptions. We’re all consumers of media, and media influences how we look at one another. I try to get people to think about the information they’re receiving rather than just to embrace it.